SOUTHINGTON — The sign at the end of the driveway says North Ridge Golf Club. As you turn into that driveway, a bright, white clubhouse is straight ahead. Something looks very different at the old place known since 1960 as Pine Valley Golf Course. 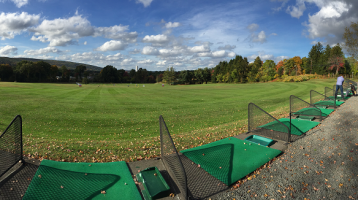 There are a lot of different and new things, other than the name, going on at the course well-known to Greater Waterbury golfers. Lovley is not just the owner, but an avid golfer as well. Five or six rounds a week are not uncommon. “He can play 36 holes straight without breaking a sweat,” said McConachie. Since purchasing the golf course last summer, Lovley has renovated the clubhouse, including the snack bar, the upstairs bar, lounge, banquet room and patio, as well as the men’s and ladies’ locker rooms. 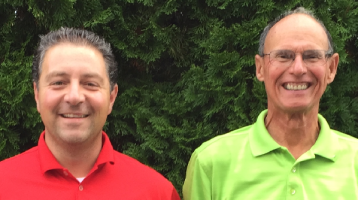 He has hired a second PGA of America professional, John Dipollina, to join McConachie in the pro shop. A fixture at the course for more than three decades, McConachie had been solo in the shop for 12 years. Dipollina had been the head pro at Gillette Ridge in Bloomfield and was also the head pro at Minnechaug in Glastonbury. The food and beverage business has been turned over to the Testa’s Banquet Facility, a well-know Southington company. Lovley also hired Tom Rodden as the new superintendent. He is a member of the Golf Course Superintendents Association of America. He has started a tree-cutting and trimming program that has opened up the golf course and has several projects on a number of holes. Work has been done to correct the drainage issues that have plagued one side of the course. North Ridge is even on Facebook now. A lot has been done, but still the perception that the club has been reduced to a nine-hole layout remains out there among area golfers and seems to have been since the sale. Pine Valley was an 18-hole golf course. 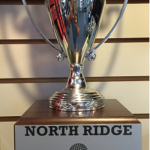 North Ridge is an 18-hole course and will be at least through the conclusion of the 2015 season. Lovley Development does have plans to starting building houses in 2016 on the front side of the course, which will remove nine holes from play. But that is not the end of the story. “We are trying to have a new concept,” said Lovley. A three-hole layout will be built on 30 acres of property the club owns alongside the 12th hole. This will serve as a quick, three-hole round for a player with time constraints, or for a three-hole practice session with one of the pros. Lovley is also pursuing the purchase of another 40 acres across the street from the club that is currently owned by Tilcon. If that deal is done, Lovley plans to build nine new holes to replace the front nine. Already, work has started on 30 new homes near the 16th fairway. Lovley reports that he already has 25 deposits on the 30 lots. Lovley has also tried a new approach to greens fees. He lowered them. Weekday greens fees for 18 holes with a cart dropped $6 to $46 and weekend fees dropped $10 to $50. Despite the lousy spring weather, the course has been busy. Memberships are up. The men’s club had around 100 members four years ago. Last year, it was down to 40, but this spring, even with the bad weather, the number is up to 50. And there some new leagues this spring. Lovley has created a new energy at the club, with players and staff. And just to add some more anticipation, he has plans for a completely new clubhouse in three years to replace the recently renovated existing facility. He does not want to slow down, and the old Pine Valley is the new, invigorated North Ridge.